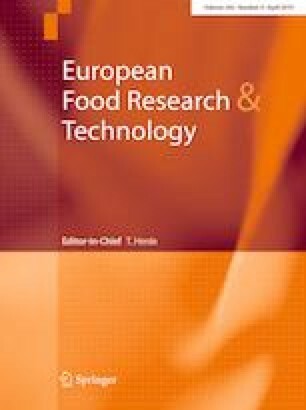 A variety of extraction methodologies were applied to chinotto (Citrus myrtifolia) fruits from Sicily, along with sensory and chemical analyses. By gas chromatographic techniques, either in monodimensional (GC-FID, GC–MS) or in multidimensional (MDGC) fashion, it was established how the isolation procedure affected the volatile fingerprint of such fruit. In general, limonene, linalyl acetate, myrcene, β-pinene, α-pinene, (E)-β-ocimene, linalool and geranyl acetate resulted to be the predominant volatiles. However, although revealed at lower levels, other compounds, such as trans-linalool oxide, perilla alcohol, trans-limonene oxide, may be responsible for peculiar olfactory notes. Compounds such as linalool, myrcene, β-pinene, octanal, decanal, and geranyl and perillyl acetates were selectively extracted by blending plus the addition of solvents. (E)-β-Ocimene and nootkatone were considerably expressed in hand-squeezed and solvent-extracted samples, respectively. On the other hand, linalyl acetate was the most abundant compound in samples extracted by solvent. Concerning the sensory evaluations, odor characters varied depending on the oil extraction methodology. Indeed, the flowery and citrus notes were perceived in all samples by the majority of panelists; conversely, the minty attribute was the one least smelled in five out of six samples. Enantio-MDGC analysis highlighted seven chiral pairs, with the following enantiomeric ratios: (−)/(+) limonene (1.8/98.2), (−)/(+) linalyl acetate (99.4/0.6), (+)/(−) β-pinene (99.8/0.2), (−)/(+) linalool (5.5/94.5), (+)/(−) terpinen-4-ol (48.9/51.1), (−)/(+) α-pinene (22.3/77.7) and (−)/(+) α-terpineol (20.5/79.5).